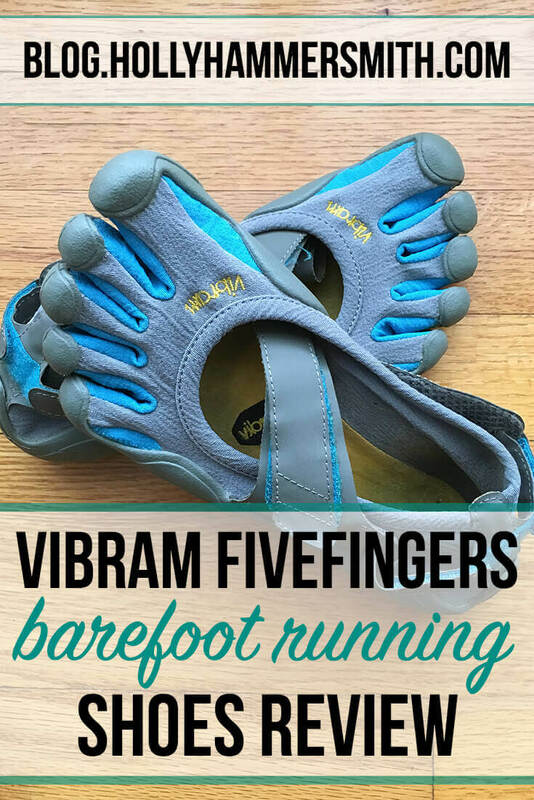 Around the same time I began to question my running method and look into barefoot running resources, I received an email from Vibram FiveFingers asking me if I would like to try a pair of their barefoot running shoes. 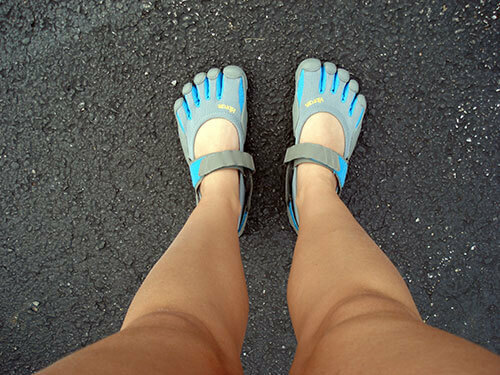 This is my Vibram FiveFingers Sprint review. I was also dealing with a hip misalignment, due to weak hip and gluteal muscles, so the timing was perfect. 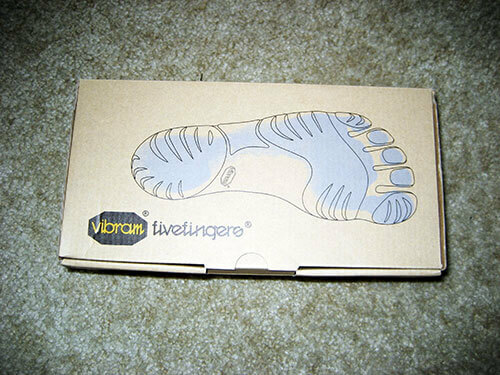 I opted to try a veteran shoe from the company’s barefoot running line, the Vibram FiveFingers Sprint. I selected a blue and gray color scheme, to match my racing outfits. 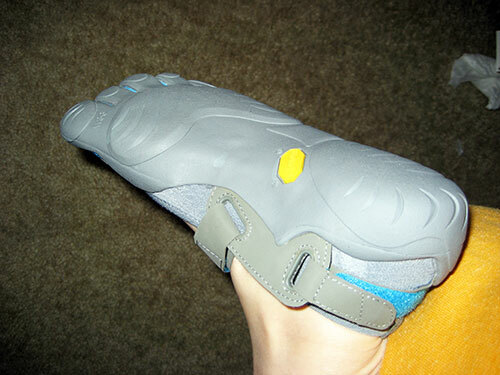 The Vibram FiveFingers Sprint retails for about $79.99. Comfort/Fit: I have not had any issues or pains wearing the Vibram FiveFingers Sprint, even when I have increased my mileage, walking 3 to 4 miles in the shoes. The only time I have had any discomfort in the shoes was when I put them on right after work one day. My feet were already sweaty and swollen from my dress shoes and it was very humid out. I walked about 2 miles and my feet began to get a few “hot spots.” I will attribute this to the state of my feet and the weather that day, rather than the shoes. The first few times they are a bit challenging to put on. Basically your toes want to do one thing and don’t realize where the shoes is. I had trouble with my second toe trying to get into the third toe’s “pocket.” I can assure you that if you try Vibram FiveFingers Sprint your toes will get used to them eventually. Easy Adjustment: I attribute my lack of adjustment (ie. no pains or problems) in the shoes to the fact that I walk barefoot in our home 24/7. I had read reviews from other runners online and even heeded the advise of the representative I worked with – don’t run too much in them too early. Ease your way into the shoes, they said. The first time I walked about 1/2 mile. The second time I ran just over 1/2 mile. The third time I walked about 3 miles. I am now comfortably running 8 miles per week in the shoes. 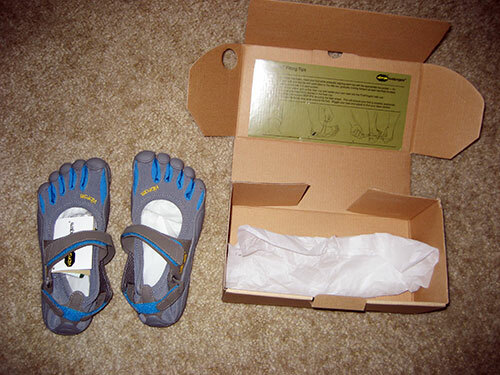 Quality: That is what has stood out foremost to me about the Vibram FiveFingers Sprint product. The price of the shoes can be daunting. Most pairs average around $100. I was pleased to find strong stitching in the shoes, tight seams and solid bonding of the rubber sole to the fabric. In all a high-quality product. Barefoot Muscle Use: The shoes do fit very flat to the ground. There is not much of a heel. Just a bit of fabric in the heel of the shoe. You will feel your muscles and tops of your feet working in new ways when wearing these. Is that good or bad? From my perspective I don’t think it can be bad. I don’t see any “harm” in this type of footwear, when used in moderation. Overall: I would not yet advocate these as a 24/7 running shoe just because of the potential to get sore from overuse of lesser-used muscles and tendons. I have heard too many stories of folks who used the shoes too much and then found themselves laid up. However, I have also been able to run in the Vibram FiveFingers Sprint while on a treadmill and I will continue to run in the shoes moderately. Disclosure: I am not compensated for product reviews, unless otherwise stated. I was given a free sample of the product in exchange for writing a Vibram FiveFingers Sprint review. All opinions and thoughts here are my own. Some links within this post are affiliate links. Im glad that they are working for you 🙂 I have yet to try them but do see a pair in my future–I'll do the same "ease in" period you are doing. I run in Sprints! I love them! So I’m thinking about getting this, would they be a good pair to get for treadmill running. I like to run at least a couple miles every day or two, I’m wondering if they are more for shorter runs. I don’t want to get them and end up wearing them down too quick! It’s hard to say Theresa. I know some folks who run exclusively in them, including long distances. Mine are 1 year old and have a decent amount of wear from running in them 1x per week. Some users claim the shoes have lasted 1,000+ miles per pair. MGA wears them and loves them. Love your self photo – cracking me up, girl! Can I also say that I laughed when you were describing your toes doing their own thing rather than going into the appropriate toe slot – I laughed because I wear toe socks and although it's been 2 years, my toes STILL go where ever the heck they want – half of my sock putting on time is getting them out of their neighbor's slot and into their own. Great review – sounds like this might really be working for you. Awesome – can't wait to hear more! 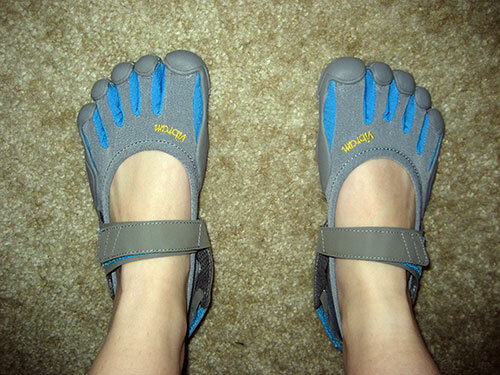 I'm glad you are liking your vibrams. I tried running in some saucony kinvaras which are minimalist style and had a horrible experience. Terrible arch pain, etc. I wish minimalist was for me but definitely not at this point. B has a pair of VFF. He was running in them for a while, but isn't anymore. He's 6'3 and 220 and claims they "aren't for big guy running". He wears them around the house and when he's doing pushups/abs and whatever. My running buddy has a pair! He absolutely swears by them–says they have helped his knees tremendously. Loved the review! my hubs LOVES his five fingers. LOVES. his hip/leg/knee pain is down to nothing and his form has totally improved! hey girl! thanks for the take on the VFFs! i am yet to try them, but am kind of fascinated by them! i will order sprint later. I have had a bunion removed and 2 toes straightened. I can only sleep at nite with teo separators on that foot. also I get pain on the opposite side of tht foot-when I run around barefoot. Do you think these would be a good didea to use-as I’m reintroducing my feet to walking long distances again??? Hi Mary. My experience is that I have to move my toes a bit to get them into the shoes. Additionally my toes do bend while I am running or walking in the shoes. Not sure if that will help you out or not. If you can find the shoes at a local running or walking shop, perhaps you can try a pair on in person and see how they feel in person. Best of luck! Hi all. I am getting some sprints this winter and I was wondering if you have any tips for these shoes. I dont really run, but I weight lift, and I’m concerned because of the stories I hear about people hurting their feet. Hi Em – My best advice would be to start with smaller distances and work your way up. Also consider walking in the shoes and building distance that way before running, if you chose to try running in them. Personally I have not worn these in the weight room because they do not provide any sort of thick cover over the top of the foot, which could pose a danger if you drop a weight. I’d rather drop a weight on my old Asics or New Balance that my nearly bare foot! I live near a beach in RI, which is ideal for long, seashore wqlks. I’m looking for shoes that will protect my feet, are suitable for walking in water and will stay on during a vigorous walk. I had both knees replace and need to guard against unprotected heel strike. Any advice and/or suggestion are gratefully appreciaited. Thanks! I can only really comment on the Sprint shoe as that’s the one I own. I do not wear the shoes in water so I don’t know if they would be good for that or not. The Sprint do stay on with the strap over the top of the foot. I have had no issues with the shoes coming off. Thanks, no luck thus far. My husband and I own a garden center – the 1st 2 months of walking on gravel 8 hrs. a day caused me extreme foot pain. I had previously had plantar facia problems in my life and I didn’t know what I was going to do – my daughter had been running in Vibram Sprints for about a year and bought me a pair. ALL of my foot problems have gone away (it’s been 3 years now!) and I own 5 pair of Vibrams in different styles. I will NEVER put a pair of sneaker type shoes on again! I wear my Vibrams 10+ hrs. a day – I walk all day – up & down gravel, stairs, etc. I even have run in them – they have changed my life!